At Flagler College in the main lobby rotunda. 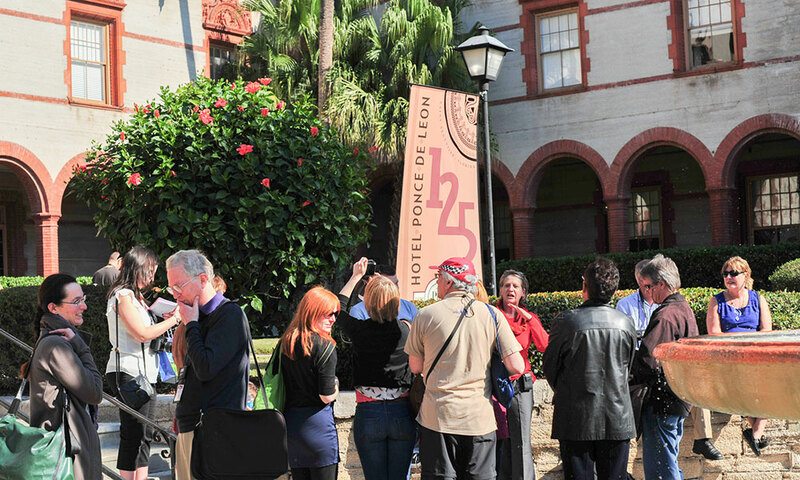 Legacy Tours of Flagler College showcase the architectural heritage and fascinating history of the former Hotel Ponce de Leon, a nationally designated historic landmark building, built by Henry Flagler in 1887. Millionaire industrialist and developer Henry M. Flagler envisioned creating an American Riviera in St. Augustine. His Hotel Ponce de Leon, now Flagler College, beautifully recaptures the architectural spirit of old Europe. Presidents, dignitaries, royalty, and the upper class walked the halls of this magnificent hotel during its heyday. Designed for entertainment, relaxation and grandeur, Flagler's hotel incorporated all of the modern conveniences of the time, including electricity, running water, and a Thomas Edison clock, one of the first ever to be used in a public space. The Ponce de Leon is also home to the largest collection of Louis Comfort Tiffany stained glass windows, with over 79 windows decorate the Dining Hall, which is included on the tour. On the legacy tour, visitors will be taken through several rooms in the old hotel, including the Rotunda, Flagler Room, and Dining Hall. Guests will see the beautiful murals painted by George W. Maynard, who also worked on the Jefferson Building and Library of Congress Building in Washington D.C. The impressive Flagler Room features Tiffany Austrian Crystal Chandeliers, and a large onyx Thomas Edison Clock. Flagler's Legacy Tours offer visitors a chance to step back in time to the Gilded Age and experience a true turn-of-the-century grand hotel. Tours last about one hour and depart daily from the main lobby (Rotunda) of Flagler College located at 74 King St.
Because Flagler College's first priority is its students, tour times vary throughout the year. Tours depart at 10:00 a.m. and 2:00 p.m. from September through April. Between May and August, tours depart on the hour from 10:00 a.m. until 3:00 p.m. See above for holiday season schedule. Tickets may be purchased at Flagler's Legacy Gifts at 59 St. George Street, or at the lobby gift shop inside Flagler College 20 minutes prior to the tour. For more information and to check tour times, please visit here or call Flagler's Legacy at (904) 823-3378. Pricing: $12 for adults, $10 for seniors, $10 for Active Military (with ID), FREE for children under age 10. Children under 12 receive a complimentary Flagler College Coloring and Activity book. St. John's County residents with ID can take the tour for free. Celebrating its 50th anniversary this year, Flagler College presents the exhibition, “Flagler 50: Celebrating a College and a Preservation Legacy, 1968-2018,” as part of the commemoration festivities. The exhibit features historic photos and comprehensive information about the college from its opening in 1968 to today. The exhibit will be held in the Flagler Room of Ponce de Leon Hall and will run from July 6, 2018, through June 30, 2019. Guests can view the exhibit through Flagler’s Legacy Tours, through the free phone app “Florida Stories,” or by picking up a free self-guided tour booklet in the Rotunda. For more information the 50th anniversary and associated events, visit here. This building and campus are amazing. 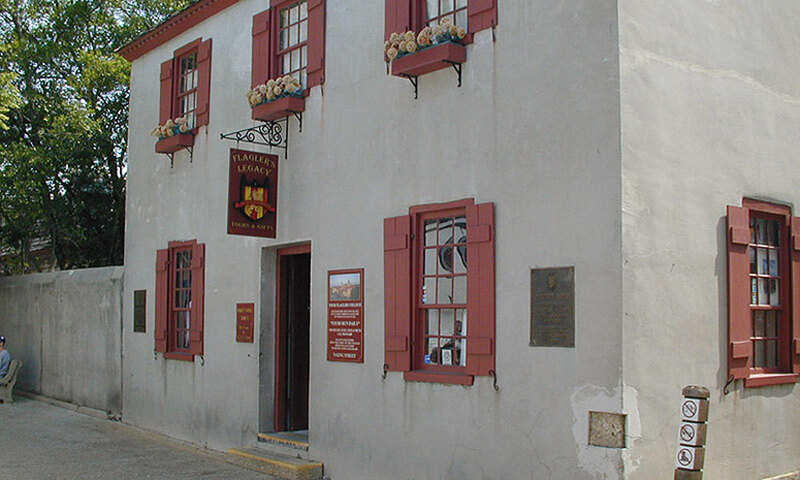 A MUST see when you visit St Augustine! We have been here several times. I loved the guides and the price is always doable!